Looking for a little German heritage in Texas? Well, look no further than New Braunfels. German names can be seen on billboards as well as street names throughout the city. Population of approximately 36,000 people and growing, New Braunfels has many exciting things to do. All My Sons of New Braunfels, your local expert moving company, can help with your new move to this exciting and expanding city. Both Comal and Guadulupe Rivers run throughout this city. 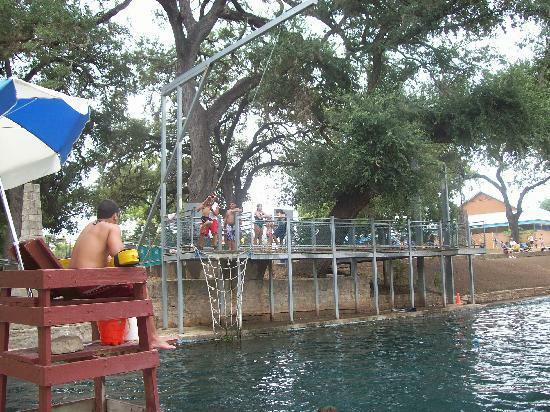 During the summer months, the San Antonio local movers suggest a visit to Shlitterbahn waterpark resort. This amazing waterpark with their uphills water coaster to their endless rivers is tons of fun for both young and adult kids! Then there's Wurstfest. A real salute to German sausage. This is one of the largest German festivals in America. Always lots of fun with great food, activities and finest in Alpine and Bavarian Style Entertainment. Wurstfest always starts on the Friday before the first Monday in November, so make sure not to come on a full stomach! Are you into trains? Perfect, then All my Sons New Braunfels, your local San Antonio moving specialists, don’t want you to miss out on Landa Park. You can walk or jog around this beautiful park, but why not ride the miniature train around the 51 acre park? That's right, a miniature train that travels throughout the park and let's you see and enjoy the scenery in a new and fun way! Get off the train and enjoy a picnic on one of their many picnic tables scattered around the park. Park Rangers do come by to collect the modest $10 fee for the use of the picnic table...small price to pay for a great picnic experience. While at Landa Park don't forget your golf clubs. Landa Park holds a 6,168 yards 18 hole golf course. The course rating is 68.9 and it has a slope rating of 112. If you are in the area, make sure to gather a foursome and enjoy hitting that Big Bertha on a beautiful golf course!! All my Sons of San Antonio, your New Braunfels moving specialists, want to make sure that you are fed properly. Here are some suggestions just to name a few of great dining at New Braunfels. You can try Mama Fu's Asian house if the mood should strike you. Not into Asian dining, then it's not a problem why not try Gruene River Grill? Maybe you are like me and have a big sweet tooth. If you do then try Naegelin's Bakery for all kind of great baked goods!!! A must if you live in New Braunfels. New Braunfels is an exciting place with lots to do. All my Sons of San Antonio movers can help you move to this area and surrounding cities as well as communities in and around San Antonio, Texas including Boerne, Converse, New Braunfels, Seguin and more. Our San Antonio movers are experts at what they do and are backed by four generations of moving experience. Make sure to choose All my Sons of San Antonio for your moving needs, you won't regret it! !